Discussion in 'Bonus Spins - Extra Spins - No Deposit Bonuses' started by Marina, Aug 22, 2013. Magic Portals the newest online videoslot from Net Entertainment will launch today at many Internet Casinos. We always looking forward to NetEnt Slot releases, because loyal, active players getting mostly free spins to try the new slot. I think that, Redbet, Whitebet, Heypoker and also Vera&John Casino will credit their existing customers a few free rounds on Magic Portals. There will be sure some more casinos where we find free games on the new slot. We will update this thread to let you know from which casinos we got free spins. Guts Casino is the first casino which added 10 free spins for me on Magic Portals. Go check if you have them too if you are an active player there. MyBet Games also just credited me 5 freespins on the new NetEnt Slot Magic Portals! I already had a nice hit with 5 wilds! Screenshot we will post later. Redbet Casino credited me free spins on Magic Portals today. 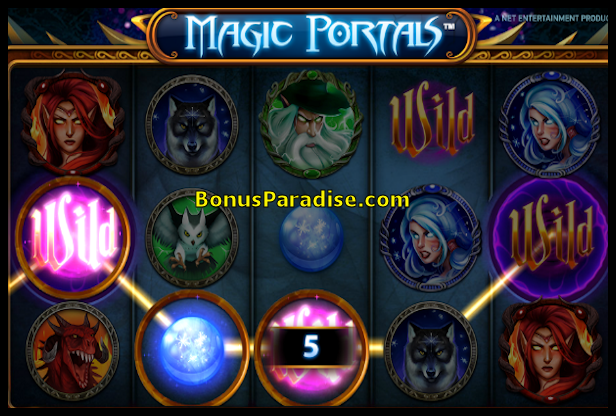 Casumo and Klaver Casino have also credited their loyal players some free spins on Magic Portals! Has anyone been lucky yet playing Magic Portals ?